Skill level: Basic. Suitable for beginners and children. The tiny doll with a huge personality. 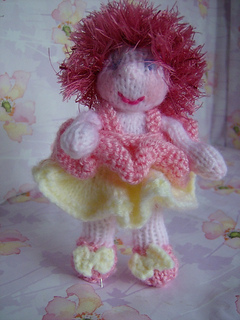 Pattern for making the 4” doll in pink & white frilled dress. Make a tiny 4 inch angel in a removeable dress. She could hang on the Christmas tree, the crib or the pushchair. 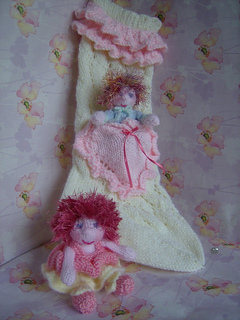 Make lovely little stocking filler presents or even be a cracker filler. 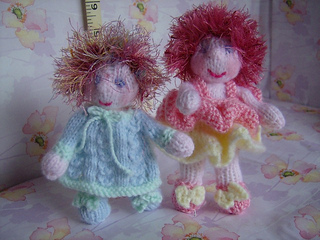 You are absolutely welcome to give/donate/fundraise with/sell any knitted products from this design. Only the pattern itself is my copyrighted design. I hope you have a lot of fun with her.